Polish driver Jakub Przygonski battled his way to victory in the Dubai International Baja powered by Nissan and AW Rostamani. 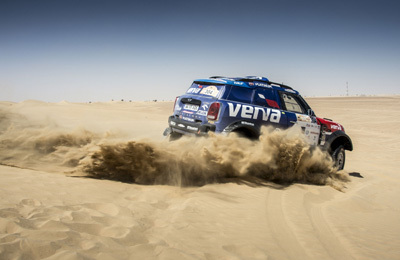 Partnered by Belgian co-driver Tom Colsoul in a Mini John Cooper, overnight leader Przygonski completed the second leg’s 174 km Nissan special stage to secure the cars title with a winning margin of 4mins 8 secs from Russians Vladimir Vasilyev and Konstantin Zhiltsov in another Mini in the second round of this year’s FIA World Cup for Cross Country Rallies. Saudi Arabia’s Yasir Hamed Seaidan with Russian co-driver Aleksei Kuzmich were third fastest another 3 mins 37 secs away in their Toyota Hilux.